A parishioner sent me a text recently. She is a teacher and was concerned about something her students were telling her. They were telling her that dogs have no soul and therefore, do not go to heaven (quite the classroom discussion between conjugating verbs). She wanted my thoughts. I told her that on the sixth day, God made the wild animals of the earth of every kind, and the cattle of every kind, and everything that creeps upon the ground of every kind. And God saw that it was good (Genesis 1: 25). Since Jesus Christ died to redeem the whole creation, that includes our pets which are a gift from God. Furthermore, due to their simplicity, many believe that animals such as dogs and cats are closer to God than human beings. When I die, I want no part of a heaven that doesn’t include Coalie, Tiger, Toby, Copper and Oliver (all past and current pets of mine). So yes, of course, our pets go to heaven! 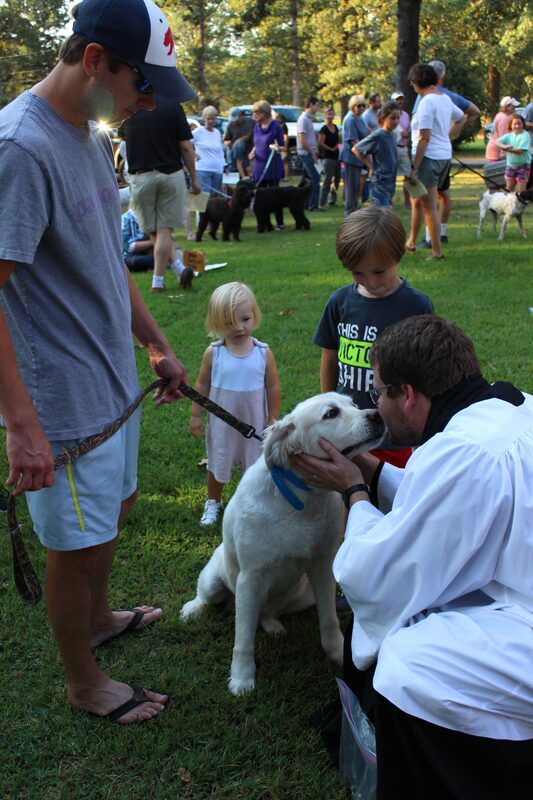 The Feast of St. Francis, patron saint of animals, will be held this Sunday, October 7, at 5p in front of the Chapel. We will remember and give thanks for our four-legged friends who are still with us, and those we have loved (and loved us!) and lost. Bring your pet(s) and have them blessed by the clergy. We will be handing out treats and each pet blessed will receive a pendant to commemorate the occasion. Bring with you a bag of dog or cat food. We will be donating these items to our local animal shelter. This is one of my favorite services all year. There is barking, jumping, whimpering, growling, licking, and perhaps a fight or two (sounds like the 11a service). My vestments are usually covered in hair afterward. It is chaos. But from chaos comes creation. So on this day we remember that it was from chaos that animals and humans alike were created by God in the beginning. And there is no better way to kick off the week of Day in the Country than with a little chaos. Come join the fun this Sunday! Copper and Oliver Compton will see you there!